Goodies Co has today November 26 introduced Free Shipping to help shoppers enjoy goodies from Cyber Monday till Friday, November 30 as Christmas fast approaches. The firm ship goodies for free plus every full order clients will make this whole week. Goodies Co says it wants everyone to enjoy free shipping on all their full sized orders or on anything they love this festive season! On November 14 WalmartLabs launched to the public, Goodies Co to help users discover new foods they’ll love. The $7 a month food subscription service for consumers to sample out new delicacies handpicked by the Goodies co team includes treats like wine biscuits, pumpkin souffle mix, dark chocolate infused Quinoa bars, and white cheddar popcorn all wrapped with a brief description just in case you might want to order for the same after tasting. Goodies Co. was not just launched to make money. Walmart says many fear trying out new foods because they think branching out is expensive, risky and time-consuming and might be disappointing if it doesn’t work. According to Ravi Raj, vice president of products @WalmartLabs wants to end that fear of launching out. Send every month, under different themes, the gift box is becoming a phenomenon with many particularly due to its simplicity. After you subscribe to Goodies Co for just $7 a month with no extra taxes or shipping charges, they get the Goodies Co. Taster’s box, taste what’s in it, review and buy the treats they love. The buyers earn points on that for further use on their next purchase. You were not the only one using Goodies Co. as it has over 3000 users already since its private beta. 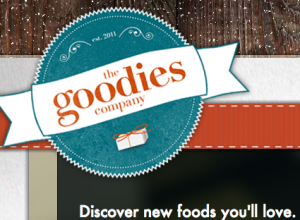 Goodies Co. send out treats under “Flavors around the World,” and “Trick-or-Treat Sweets” for Halloween and “Easy Entertaining” this Thanksgiving. Join the Goodies Co. online social community, post your reviews, earn loyalty points and redeem them on your future tasty treats or purchases in the store.